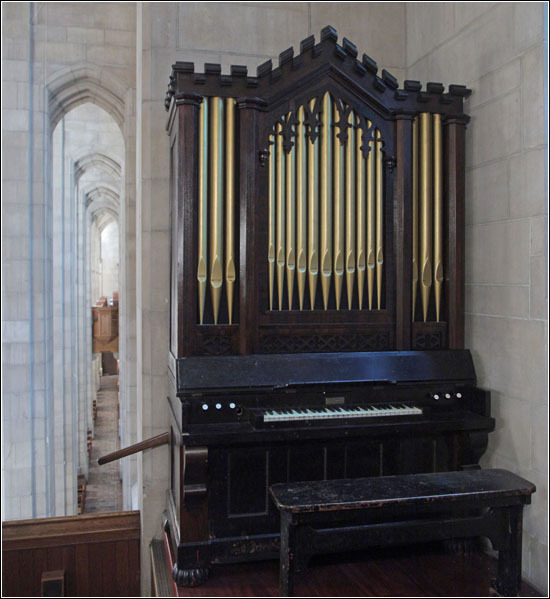 The Jardine organ, currently on loan to Fourth Presbyterian Church and located in the East Balcony of the Sanctuary, is the oldest playing organ in Chicago and was built by George Jardine in 1850. The Jardine Organ Company was based in New York City and met with great success in constructing church organs and concert hall organs. George Jardine (1800–1882) was a British barrel organ maker who immigrated to the United States in the early 1830s. When the Jardine Company closed its doors in 1899, they had built approximately 1,300 organs distributed throughout the United States and Mexico, although there are fewer than 100 left in the world today. This 1850 Jardine organ was loaned to Fourth Presbyterian Church in 2014 by Stephen Schnurr, who rescued it in 2002 from a private residence about to be demolished in Elmhurst, Illinois. The organ appears never to have had an electric blower and can be pumped by hand or foot. 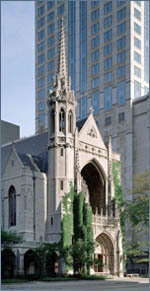 For more information about the Jardine organ at Fourth Presbyterian Church, contact John Sherer, Organist and Director of Music (312.981.3592).